Arunachal Pradesh Governor Brig. (Dr.) B.D. Mishra (Retd.) 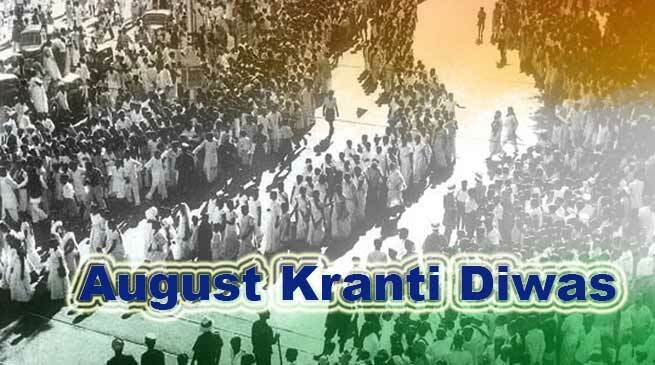 and Chief Minister Pema Khandu, greeted people on August Kranti Diwas and called for remembering the great freedom fighters who had launched the Quit India Movement on this very day in 1942. Governor Brig. (Dr.) B.D. Mishra (Retd.) In his message said that on 9th of August, we the people of India, in our Sacred Land, rise to commemorate the ‘August Kranti Diwas’. It was on this day that our freedom loving and fearless forefathers had launched the ‘Quit India Movement’ to oust the British colonial power and end the British rule on our country. On August 9, 1942 Mahatma Gandhi along with Jayaprakash Narayan, Ram Manohar Lohia, Aruna Asaf Ali and many others launched the ‘Quit India Movement’ or ‘Bharat Chodo Andolan’ in Mumbai. It was a civil disobedience movement started to cast off the yoke of the British rule. Addressing the Nation, Gandhi ji, in his speech on this Day gave the famous, far reaching ‘call’ of ‘Do or Die’ to us. The ‘Quit India Movement’ thus was a huge success throughout the country. We, today, remain beholden to all those India’s great men and women, and celebrate this Day to remember the valour of the great freedom fighters, the Governor said. On this Day, I join all my fellow Indian citizens in paying homage to the extraordinary leaders of our freedom struggle, led by Mahatma Gandhi, Father of the Nation, Let us remember that we are a free Nation today because our forefathers treated their comfort, safety, security and life secondary to our struggle for independence, the Governor further said. May this occasion instil amongst us all a new zeal for keeping the dignity of the individual and a resolve for ensuring the unity and integrity of the Nation, the Governor wished. In his message Chief Minister Pema Khandu said that this day is to pay glowing tribute to the father of Nation Mahatma Gandhi and hundred of thousands valiant freedom fighters who despite all odds stood firm against the British rule and started a civil disobedient movement. “It was for their selfless and fearless movement that we today breathe the fresh air of freedom”, Khandu said. He called upon his fellow citizens to give their every bit to uphold the sanctity of our great nation, which stands tall for displaying exemplary patriotism.